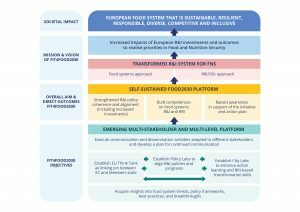 The FIT4FOOD2030 project, that started on November 1st 2017 and runs for three years, supports the EC in further developing and implementing the FOOD2030 policy framework. It does so by creating a European network, which will make existing Research and Innovation (R&I) policies on Food and Nutrition Security more coherent and explore ways to innovate R&I policy, build competences and raise awareness of FOOD2030. One of the key instruments for creating this network and maximising the impact of R&I on the food system, are the Policy Labs. Your country can now join FIT4FOOD2030 by running a Policy Lab! In the Policy Labs, European countries and regions aim to maximise the impact of R&I on future-proofing their food system. The labs bring together national and regional stakeholders from the various areas of the food system, making a point of including people who are usually not involved in policy discussions. In a series of interactive meetings over the course of the project, they analyse the current food system and related R&I landscape, define knowledge gaps and opportunities and work on innovative R&I policies. Central aspects in this process should be a holistic approach and Responsible Research and Innovation. Potential outcomes could be policy briefs, methodologies or new R&I programmes. The focus may differ per country or region, depending on their specific circumstances. During the remaining 1,5 year of the project, around three national meetings should take place for the Policy Lab. These can be supported by smaller meetings, like focus groups. In February 2018, six countries and one region started with a FIT4FOOD2030 Policy Lab. They are Flanders (Belgium), Hungary, Italy, Lithuania, The Netherlands, Norway and Romania. They have all had their first national meetings, and are now in the process of organizing the second. We are now offering three to five more countries or regions the exciting possibility to run a Policy Lab, to make up the total and help expand the FOOD2030 Platform. Within the FOOD2030 Platform, the EU Think Tank, which is made up of a diverse range of European high-level experts, forms the linking pin between the EC, the national Policy Labs and the regional City Labs. Each selected country is asked to appoint two persons to coordinate the Policy Lab, ideally from different backgrounds (agriculture and health, for example) and with complementing skill sets. The role of coordinator will be a challenging and rewarding one. They will follow a number of mandatory training sessions with Policy Lab coordinators from other countries. These training sessions are organized by the experts from the FIT4FOOD2030 consortium, like the VU Amsterdam, and will give the coordinators the theoretical background and practical tools to coordinate the Policy Labs in their countries. This will involve identifying and motivating relevant stakeholders, organizing meetings and making sure that the Policy Labs result in concrete outcomes and usable end products. All of this requires skills in project and relationship management. The second group of three to five countries and regions running a Policy Lab can claim up to between 6.000 and 10.000 Euro from the project to help cover their cost. The maximum amount that can be claimed back, will depend on how many countries are selected; if there will be three new Policy Labs the maximum will be 10.000, if there will be five new Policy Labs, the maximum will be 6.000. This money is meant for travel costs of the coordinators and the organization of national activities. Cost of staffing may not be paid from this budget. The training sessions for the coordinators are funded by the project. The project team also offers continual support and guidance in between the training sessions, as well as practical tools and knowledge generated by the project. Availability of both coordinators on 8&9th April, when their first training session will take place in Amsterdam. Part of this session will be together with the coordinators from the first seven Policy Labs. Coordinators must also be able to come to Brussels in the week of 14th October 2019. We would like to receive an informal declaration of interest by 18th February 2019. The deadline for submitting the letters of commitment is 4th March 2019. We will let you know if you have been selected in that same week, so by 8th March 2019.